Eric Rittmeier et al in the Journal PLoS ONE have given us something new and beautiful. The Paedophryne genus has four of the ten smallest creatures on four legs. You might say one small step for Paedophryne is a giant step for the evolution of the tiniest vertebrate footprints anywhere. Eric and Chris Austin of Louisiana State University and their collaborators from Bishop Museum, Hawaii and Cornell University have the pleasure of announcing these two new species of frog, one being the smallest vertebrate yet! The moist leaf litter of a Papua New Guinea rain forest is a fantasy of species, large and small. Interestingly most tiny frog species inhabit this kind of niche, world-wide with only two preferring the dense dampness of moss.There are nearly 500 species of bird there, including more parrot, pigeon and kingfisher species than anywhere else. There are 260 reptile species, including 13 turtles around 500 species of butterflies, 250 known mammals and critically, 200 frogs. That is without those incredible plants that form the actual environment, naturally! This particular miniatuarised frog has reduced digit size and reduced skull bones as is normal with such dwarfing for the vertebrate anatomy. All Paedophryne also show the sacrum reduced by having one fewer vertebrae. Reduction in fecundity and increase in egg size is also normal in frog miniatures. Most of the 29 smallest lack a tadpole, which means they have to develop directly into the typical anuran shape. It's possible that direct development helps the evolution of small species, as there are larger direct developers in each of these frog groups. Water loss is vital at such a size , just as cold is to the small in volume. Because the temperate forests always have a dry season, this could explain why only permanently soggy tropical forests maintain habitats for tiny frogs. Predation by invertebrates could keep them from more aquatic habitats. Similarly, upland regions that favour our miniature frog spp. tend to have fewer invertebrate spp than low-lying regions. 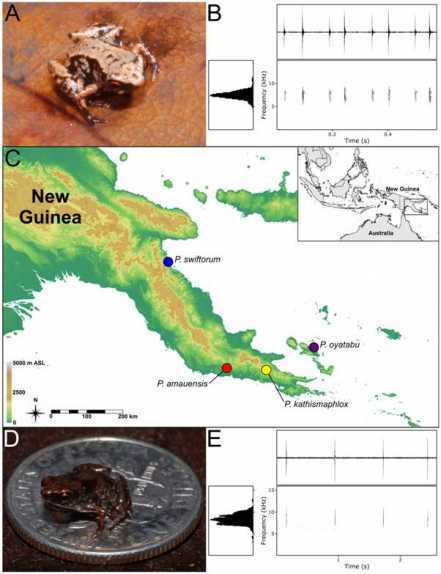 The unique genus of Paedophryne has been diverging in New Guinea since their microhylid group began "radiating." This has created a schism between two halves of the genus. The two new discoveries are apparently common in their separate mountain habitats in east-central New Guinea. The researchers mainly gauge this by the frequency of their insect-like calls all day long in the forest. They live only 50cm apart for territorial reasons and will therefore significantly account for predation (very small invertebrates such as springtails) and as prey (not much larger invertebrates and vertebrates). The richness of the islands' jungle has bemused for many generations. Now we are still discovering common new plants and animals, as the mining , agricultural and industrial giants assume a sinister place in the shadows.